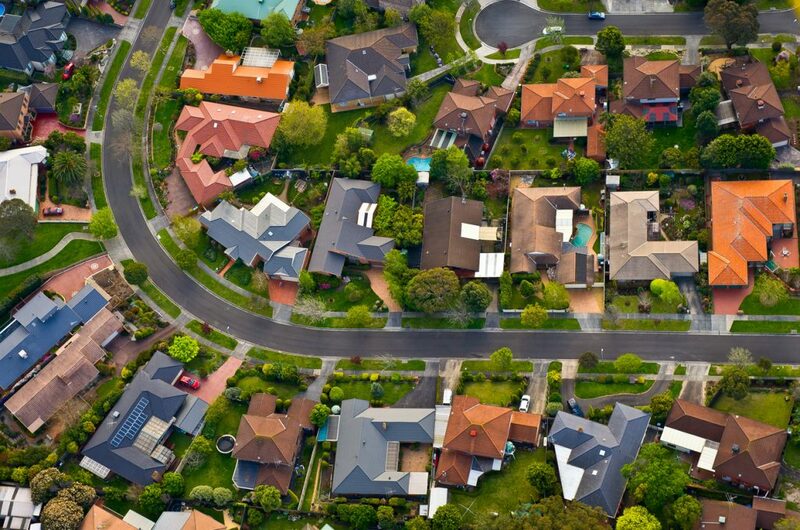 There has been a lot of talk about Australia’s “hot property market”, however there has actually been little value growth over the past decade outside of Sydney and Melbourne, with negative growth in some regions, according to research by CoreLogic. National dwelling value growth increased by 41.8 per cent over the 10 years leading to January 2018. This has mainly been driven by Sydney and Melbourne, which saw significant dwelling value growth over the decade. Sydney dwelling values grew 79.3 per cent, followed by Melbourne dwelling values increasing by 72.4 per cent. Regional Victoria also saw strong growth levels (42.7 per cent), making these three regions the only places in Australia to see value growth in excess of the National figure. Regional WA saw the largest decrease in dwelling value, falling by -29.5 per cent. This was followed by Perth (-6.9 per cent) and Regional QLD (-5.1 per cent). These areas were also hit hard during the GFC, and have struggled to climb out of negative numbers. CoreLogic Head Researcher, Cameron Kusher, has described the influence of the 2008 GFC as causing “dwelling values to begin to slide” but the housing market improved shortly after. “Although the periods of decline varied across regions, generally values started to fall early in 2008 with value growth returning in early 2009. The declines were fairly short and sharp. “The declining housing market was reversed due to two main factors: a swift reduction in mortgage rates and the introduction of government stimulus including additional first home buyer incentives which helped stimulate growth in demand and subsequently values,” said Kusher. Western Australia dwelling value growth suffered most significantly in this time, with Regional WA falling by -12.2 per cent, and Perth falling by -11 per cent. 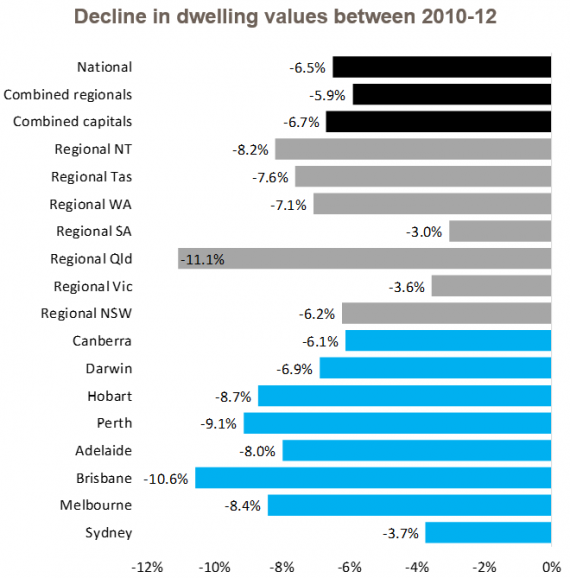 CoreLogic data found that between June 2010 and February 2012, national dwelling values fell by -6.5 per cent. During this period, QLD overtook WA in declining dwelling values across Australia. Regional QLD fell by -11.1 per cent and Brisbane fell by -10.6 per cent. “Following the stimulus-led re-inflation of dwelling values post-GFC, as the stimulus was removed from the market values once again started to fall,” said Mr Kusher. “First home buyer incentives were removed and the Reserve Bank started to lift interest rates from their generational lows. “Between 2010 and 2012, although timing does vary somewhat across the regions, the national housing market once again experienced value declines,” said Mr Kusher. CoreLogic has also charted the differences between dwelling values as of January 2018, and that areas historic peak. For most of Australia, current dwelling values are lower than their highest peak throughout the last decade. Brisbane and Hobart are the only capital cities in which values were not lower than their previous peak over the ten year period. This was also seen in Regional NSW, Regional VIC and Regional Tas. 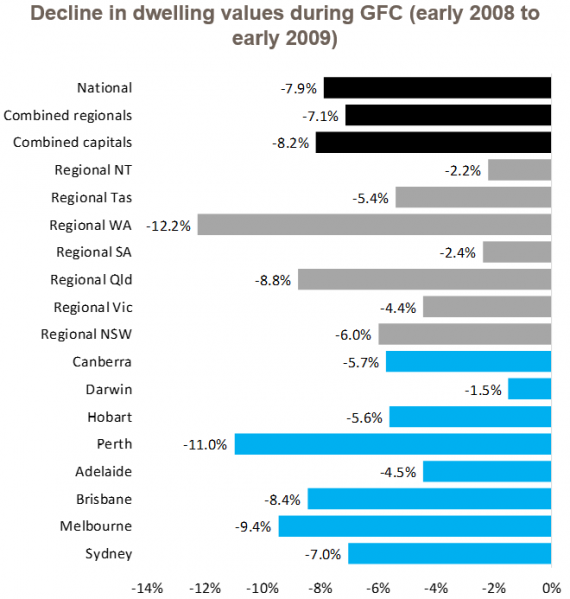 The most significant change over the ten year period was seen in Regional WA. Dwelling values in Regional WA for January 2018 are 29.5 per cent lower than when they were at last at peak ten years ago (January 2008). 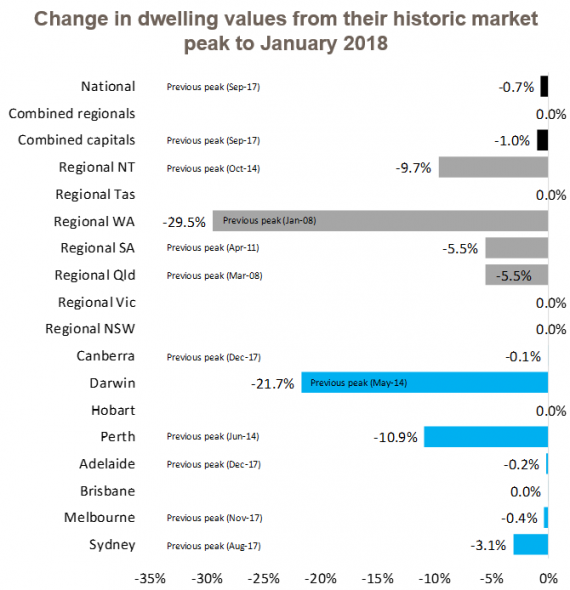 In terms of capital cities, Darwin saw the most significant change in dwelling values as of January 2018 compared to its peak. Dwelling values in Darwin for January 2018 are 21.7 per cent lower than when they were at last at peak in May 2014. “The data presented also highlights how during the value growth periods, growth has very much been slanted towards the Sydney and Melbourne markets. “With dwelling values now falling in a number of regions, it will be interesting to see how rapidly values, fall, what may or may not be done to slow the falls and how the market declines will compare to other periods of decline over the past decade,” said Mr Kusher.